Of course the first thing you think of when you hear Loch Ness is the legendary monster, Nessie. I heard about many sightings but even as a kid I doubted the monster existed. Still, when I realized we would be going close to Loch Ness on our way to Isle of Skye, I thought it would be fun to explore and see if I could have my own Nessie sighting. 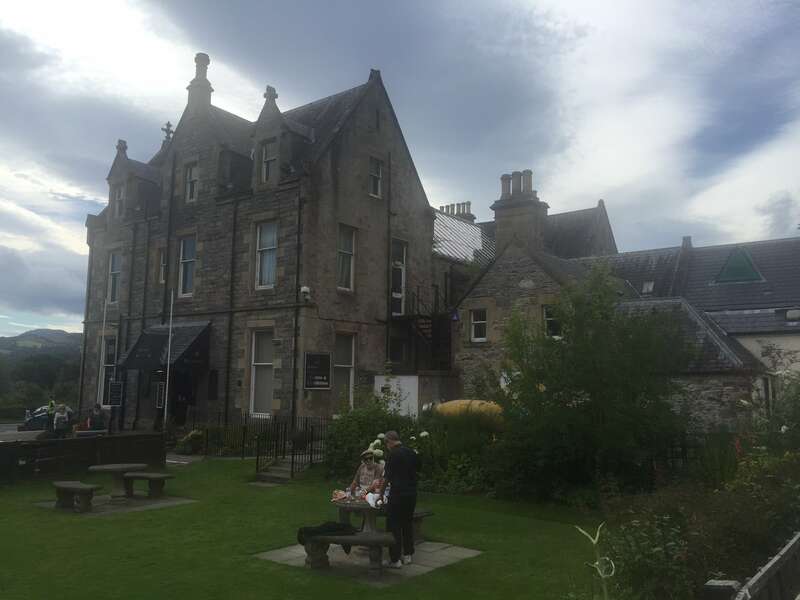 We planned on visiting the Loch Ness Exhibition Centre to learn about the history and then go looking for Nessie on a Loch Ness boat tour during our week in Scotland. Loch Ness Exhibition Centre is in a pretty building! We started our Loch Ness tour at the Loch Ness Exhibition Centre so that we could learn a little bit more about the history. 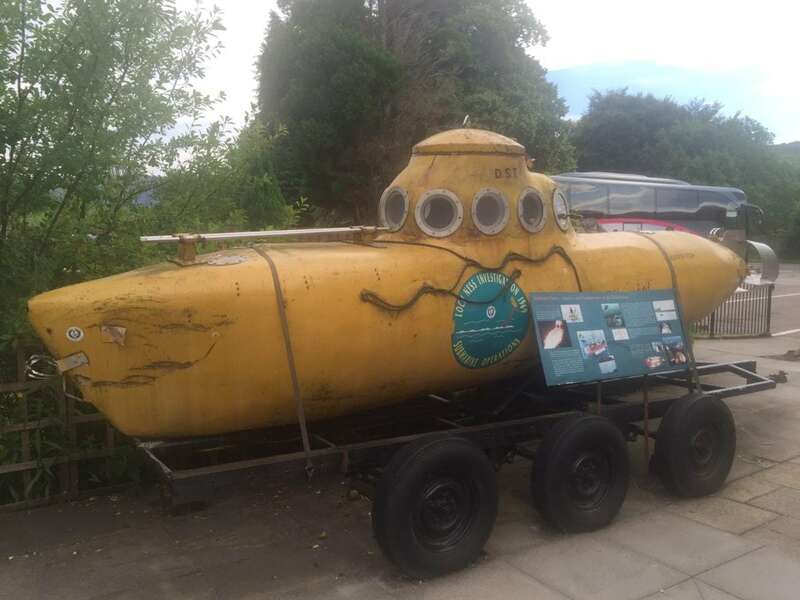 Outside the building, there is the submarine that was used in the Loch Ness investigation in 1969. Most of the exhibition is videos telling the history of Nessie and all the scientific research that has been done. You move through the rooms watching short videos with some pretty fun special effects. Instead of a video, the last room has several exhibits. I enjoyed the section about the eyewitness accounts, it was interesting to hear the conviction in their stories. 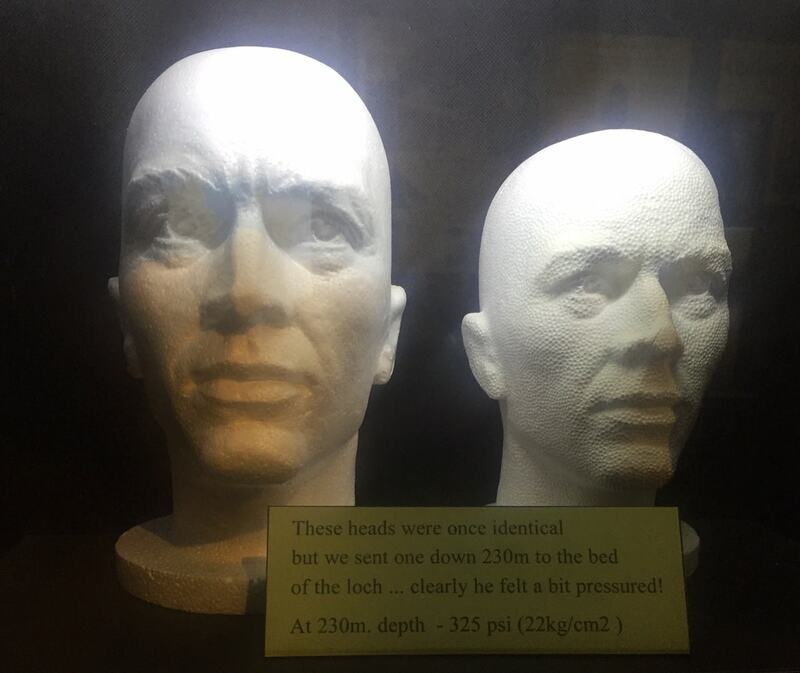 I also thought it was interesting that they showed two Styrofoam heads which used to be identical until one was taken down 230M to the bed of the Loch. That head got compressed and puts the depth of the water into perspective. The Loch Ness Centre also has a gift shop where you can get your Nessie souvenirs. That evening, we planned to go on the lake with Cruise Loch Ness to see if we could spot Nessie for ourselves. The boat leaves from Fort Augustus Loch Ness, at the south end of the lake. 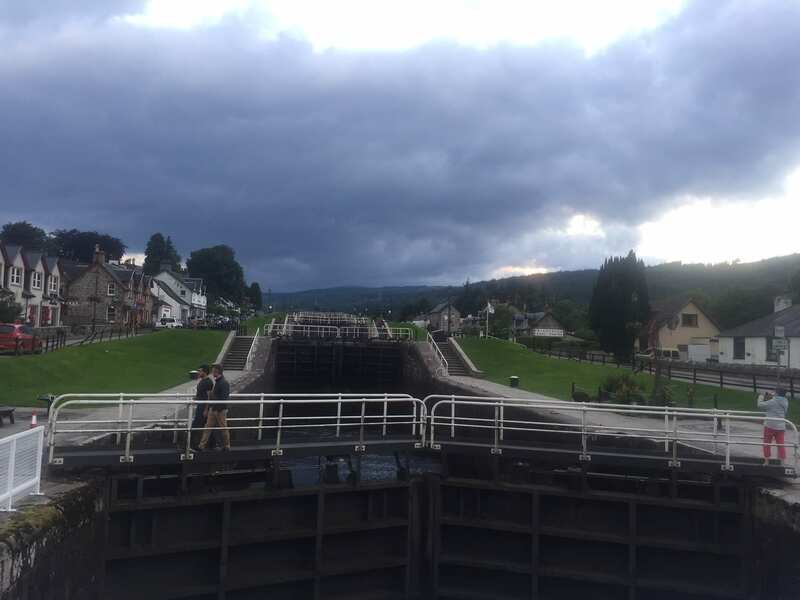 Before we boarded the boat, we went across the street and explored the locks of the Caledonian Canal, which were actually built in the early 1800s! The Loch Ness boat tour left promptly at 8 pm just as the sun was about to set. The boat had two levels, and we sat outside on the top deck since the weather was nice. Our tour guide narrated as we went along the coastline admiring the scenery. I wasn’t expecting to see any wildlife on our Loch Ness cruise, but thanks to the good eye of our tour guide, he pointed out several sheep and deer hidden in the woods. We also saw cormorants. The silhouette from these birds may have led to some Nessie sightings. Our guide also pointed out a section of the shore area called the horseshoe, where missing vegetation creates a horseshoe shape. 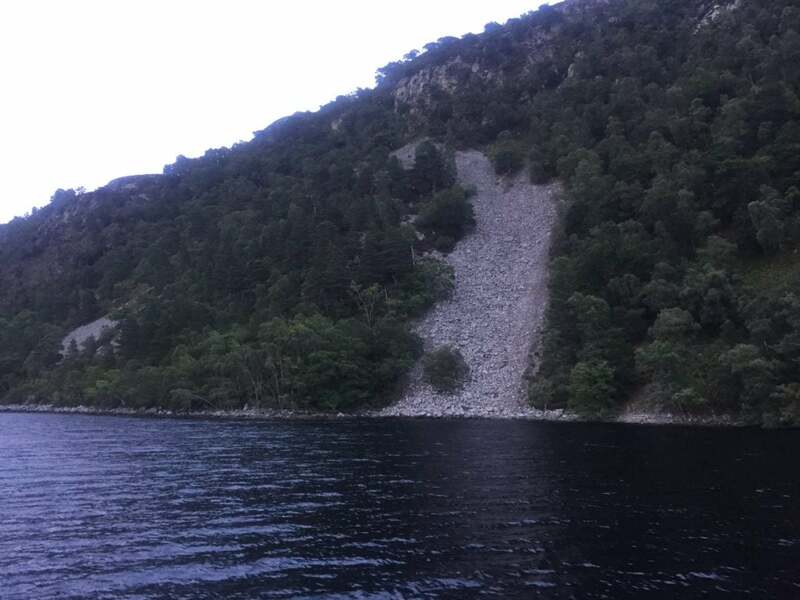 Of course, the story is that the mountain was damaged by Nessie trying to escape! Then our tour guide invited everyone downstairs for a sonar lesson. To be honest, I wasn’t interested in it but figured since it was getting dark I might as well go inside. However, learning about the sonar was fascinating. We learned how two different screens showed the depth of the water. One even had dots to show the Loch Ness fish. It was impressive to see how the depth of the lake changes so dramatically. One of the sonar screens that we learned about. 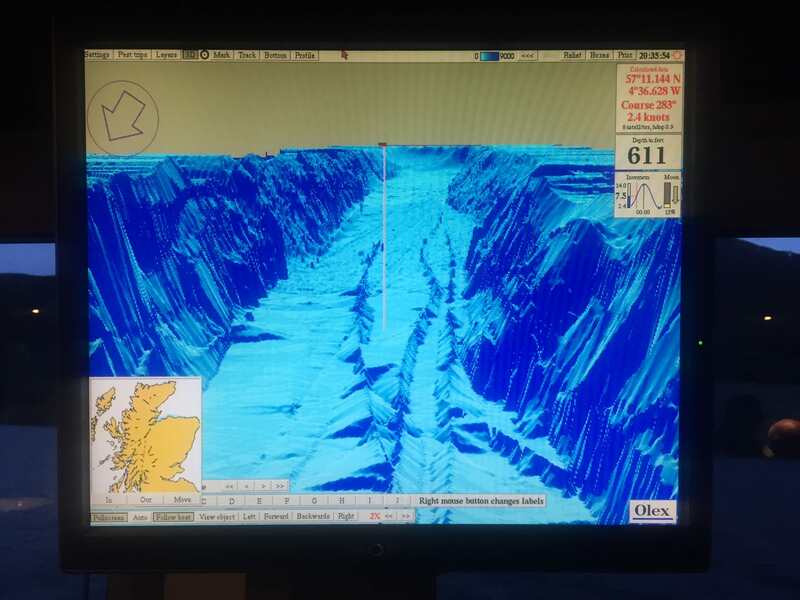 You can see the dramatic changes in the depth of Loch Ness. Then it was time for the part of the cruise on Loch Ness that everyone was waiting for. Our guide asked if anyone wanted to get video of Nessie. Of course, I was curious and raised my hand. Russell and I followed the guide as he helped us get our Nessie video. Take a look and let me know what you think!? We had a fun and educational day in Loch Ness visiting the Loch Ness Exhibition Centre and exploring with Cruise Loch Ness. Our tour guide kept us entertained! We also visited Urquhart Castle. There are plenty of things to do in the Scottish Highlands. 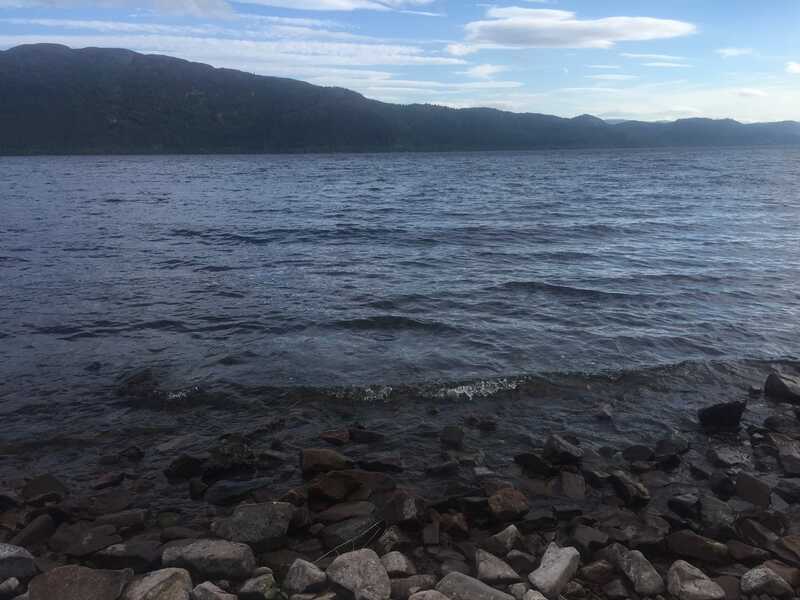 It is a beautiful area and the story of Nessie is definitely intriguing. You definitely need to do one of the Loch Ness boat trips and search for yourself. Have you visited Loch Ness or had any usual sightings? What are your thoughts on Nessie? Learn more about the history of Loch Ness at the Loch Ness Exhibition Centre. Be sure to catch the sonar lesson on your boat ride with Cruise Loch Ness. Keep an open mind, you never know what you will see. Disclosure: No financial compensation was received, but we were guests of the Loch Ness Exhibition Centre and Cruise Loch Ness. As always, opinions expressed here are my own. Love your travels! Perhaps someday Ken and Kevin will bump into our fellow Texas somewhere on the road. Kevin – Thanks so much! Would be great to run into you guys at some point. I wonder if anyone has ever been to Loch Ness and not looked for the monster? We took our boys there many years ago when they were young and they looked pretty hard. Lyn – That’s a very good question. I am sure there are a few though. Melissa – I really think you would enjoy Loch Ness. At the Loch Ness Exhibition Centre they had a Nessie store and it was full of so many cute stuffed Nessies – I hope she really looks like them! It is really hard to plan a trip to Scotland because there is just so much to see, so understand that. Loch Ness is a very interesting place to visit. I wonder if Nessie still alive these days. Great post! Thanks Gina, glad you enjoyed the post. Yes, I think there will always debate about whether Nessie exists! Wow, what an awesome experience! I remember reading stories of the Loch Ness monster as a kid, it would be so cool to visit! Love the video, though it doesn’t really look much like a monster! Maggie – Yes, I was really curious to visit too. Glad you enjoyed the video. Thanks Laura. Yeah I was really fascinated by the sonar and yes it is a beautiful place. Haha great video of Nessie! I wish I’d been that lucky when I traveled to the area about 15 years ago! I’m glad that you had a fun and educational tour of the lake. I had no idea that the volume of water in Loch Ness was more than that in all the lakes of England and Wales combined! Thanks Erika. Yeah you would never think the lake holds that much water and is so deep! Haha, that video was funny. I had no idea that they did Loch Ness tours but I guess it was inevitable. I’m adding it to my list of things to do when I visit the Scottish Highlands. Thanks glad you enjoyed it. You are going to love the Highlands. More about it to come. I wish I would have made time to see Loch Ness while I was in Scotland last. Looks like you had fun! Thanks Jaye. We did have fun, so hope you make it back to Scotland at some point! I remember that name from a rollercoaster ride. That is interesting background of Lochness. Thanks Rosi. I guess it would make a good name for a roller coaster. So is the story about “nessie” true? Does the Loch Ness exist? Fascinating experience. Loved reading about your sonar experience. Looks like you had a great time. Thanks Rosemary. It was a great experience. I think everyone should make their own decision about Nessie. I’d love to do a little tour for Nessie. I’ve got Scottish heritage so love hearing all of these sorts of stories. Sounds like you had a lot of fun! Caitlin – Thanks we loved it there! Hope you get to do a tour someday. Quite intriguing! This ones one of my favourite legends and the eye witness accounts must have been fun to hear! Thanks Upasna, it was really interesting. You should go on your own search. We have been to Scotland many times but not to this part. Sounds like a fun experience and educational at the same time, and I am sure the video is genuine!! Yes, you guys should go on your own search for Nessie! I hope the video at least made you laugh! Sounds like a great experience!! It makes me want to go. Thanks for the tips too! Thanks Christine. It was lovely, so I hope you get the chance to visit. Loch Ness is a wonderful place. It was super still when I visited, so Nessie must have been having a sleep. Have you seen the new photos in the news this week? It looks like a couple of seals to me, but exciting nonetheless!! Elaine – Thanks I did see it yesterday. It is just really amazing how the story has captured people for so long! Mysterious Loch Ness monster! Used to have a scary image of it in my mind as a child. Have this on my list…someday, soon. Punita – I hope Nessie is a nice monster! Thanks for commenting and I hope you make it there someday soon. Angie – so glad you enjoyed the post. Yes, we had a great time and I loved Urquhart Castle too. Hehe I’ve been Nessie spotting at Lock Ness – but only from the shore. Love that video! ? Thanks Katie! Glad you enjoyed the video, it makes me laugh too! Good to know that Nessie is doing well. 😉 Love your video! Haha Jurga – Thanks so glad you enjoyed it! David – Thank you. Yes, I agree it is a must. I will tell you though we had a hard time deciding on our itinerary for our Scotland trip because there are just so many amazing places. Lots more to come, so stay tuned. What a fun experience! This reminds me of Roswell , New Mexico and visiting the UFO museum. It is interesting to read people’s accounts and hear their stories. Also your video made me laugh! Chantell – Yes. I can imagine Roswell is similar, but I haven’t been there. The UFO museum sounds interesting. Glad you enjoyed the video. This looks like a blast! I can’t imagine riding around in that ancient little submarine looking for a mythical monster… hello claustrophobia. Thanks Alex. Haha yes, I think the boat cruise is the better way to go! LOVE that video of Nessie! I’m convinced! 😉 Haha, but seriously, it sounds like a lovely time! I have of course heard of the Loch Ness monster, but I never thought of it as a place to visit! So cool, and definitely something I’ll have to add to my list. Thank you for sharing! Thanks Maria, glad you enjoyed it and hope you get to search for Nessie yourself someday. Did they discuss how and why the legend of Nessie began? Sally – There have been 100s of sightings. One that really got the legend started was when the hotel manager had a sighting. The exhibition centre also discussed some of the scientific reasons that have led to the sightings like the murkiness of the water, etc. Lolo – Thanks. It is such an interesting place. Scotland is definitely a must visit, there is just so much to see! Always good to keep an open mind! I’m not particularly superstitious but you never know what might happen. Then again, I’m pretty freaked out by deep water to begin with. What a unique experience! Thanks Jessica, it was definitely interesting and we had a great time. Thanks Roota. It was fun and glad you liked the video. 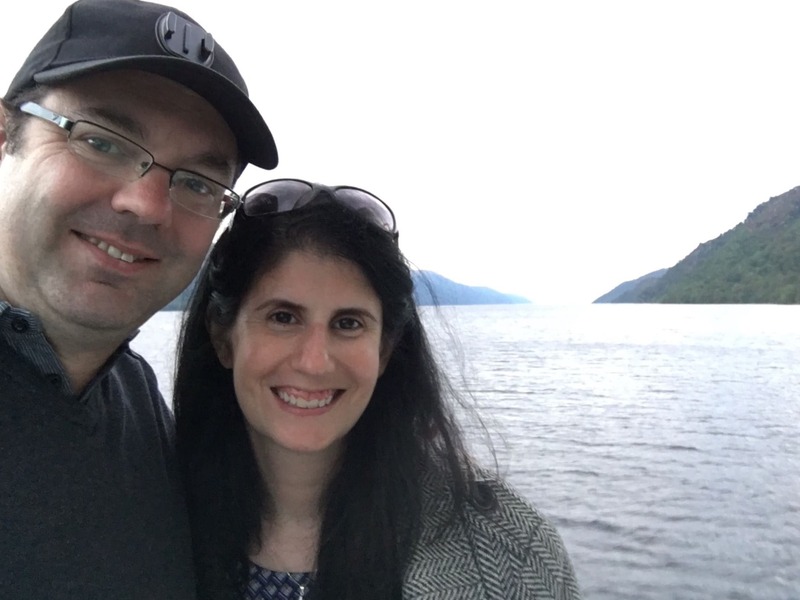 We spent a few hours around Loch Ness on our way to Isle of Skye this summer. Such a fascinating a fun history to hear. There were so many people around, so it was hard to get swept up in the magic of it. It seems that you had fantastic immersion in the tales and area! Lovely share! Thanks Eulanda. Glad you got to visit Loch Ness too and happy you enjoyed the post. Thanks Upeksha. It was a really interesting place and we had a great time.